The DCX-PCI-300-H motion controller, high-density SCSI connector version, uses widely available (and therefore low-cost) industry-standard SCSI cables. Many customers prefer the convenience of ordering these directly from PMC. However, some customers may wish to design their own interconnection boards or purchase cables in volume directly from a SCSI cable manufacturer or distributor. For these customers we provide the following information to help them find and specify the right parts. Signals for up to eight (16) closed-loop axes and up to 128 additional analog or digital I/O lines are available on the DCX-PCI-300-H Motion Controller. To connect these signals to the outside world, up to four shielded high-density SCSI cables can be connected to the DCX-PCI-300-H card (One cable handles all I/O from up to two modules.) The cables used with the DCX-BF3XX-H breakout board are called: 68-pin offset 0.8mm VHDCI ("SCSI-5") Male to 68-pin offset 0.8mm VHDCI Male cable assemblies. Note: Customers designing their own custom interconnection board may prefer to use a larger connector on their breakout board to simplify their PCB layout, in which case the larger 68-pin HD68 connector should be specified instead of the 68-pin VHDCI. 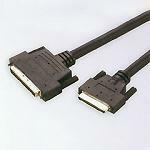 In this case, the mating cable would be specified as a: 68-pin offset 0.8mm VHDCI ("SCSI-5") Male to 68-pin HD68 ("SCSI-3") Male cable assembly. The cable connectors that connect the DCX-PCI-300-H card on one end, and to the DCX-BF3XX-H wiring breakout board at the other end are called "Offset 0.8mm VHDCI Male" connectors. They are also commonly called "SCSI-5" or "SCSI-V", "Micro-Centronics" or "Ultra-Micro Centronics", and sometimes called a "VHD68" connector. Customers designing their own custom breakout board may want to use a larger connector on their breakout board to simplify the board design. In this case, a "HD68 Male SCSI" connector should be specified for that end of the cable. This connector is also commonly called; "SCSI-II/III", "SCSI-3" or "micro DB68", and less frequently referred to as; "half-pitch 68", "HP68", "HP68D", "half-pitch DB68", "half-pitch 68 D-type", "68 pin Micro-D (High-Density or Honda)" or "Ultra SCSI-II/SCSI-III". Due to the narrow width of a PCI expansion slot, very close stacking of connectors is required for plugging multiple cables into the DCX-PCI-300-H card. Therefore "offset" VHDCI cable connectors must be used. To the right is an illustration of two closely stacked offset connectors, made possible by the "off-center" location of these connectors with respect to their backshells.